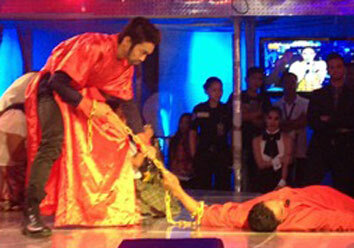 FAMILY OF ‘INFOTAINERS’ WINS IT’S SHOWTIME BIDA KAPAMILYA FINALS. For incorporating different talents into an explosive performance that effectively portrayed history, the Agravante family of Sta. Cruz, Laguna took home P1 million and was declared grand champion in the “Bida Kapamilya Round 2: The Finals” of ABS-CBN’s noontime show It’s Showtime last May 11. Mentored by actress-comedienne Giselle Sanchez, the Agravante family interpreted through singing, dancing, and acting how Filipinos fought for freedom during the Spanish occupation. The family earned the highest average score of 9.8 from the judges, beating other seven families, even though they were only given one day to conceptualize and practice a new routine after being selected winner in the wildcard round last Thursday. ABS-CBN's noontime show will introduce a new segment called “Bida Kids” featuring talented kids aged three to 12 years old. It’s Showtime airs Mondays to Fridays at 12:30 PM and on Saturdays at 12NN on ABS-CBN.